Poll: What's your opinion of Kamen Rider Build? A genius Rider who builds everything. Spoiler rules: No posting information about unreleased stuff. Preview and movie promo discussion must be in marked spoiler tags. 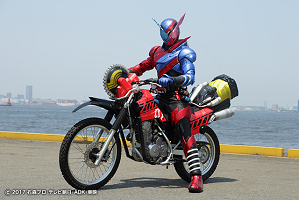 Re: Poll: What's your opinion of Kamen Rider Build? Overall I don't dislike this season. I found a lot of parts of it to be enjoyable. I thought the cast was a bit stronger than most seasons, there weren't many useless side characters (looking you Shibuya and Narita), and the comedic bits worked for me at least. As for some criticisms, I don't really care much for the full bottles. They just feel like worse versions of gaia memories. It didn't feel like there was really enough plot to carry the whole season. I feel like a lot of season was spent waiting for the next power up to appear. Were there plans for Queen Bernage to do more? I feel like I was expecting a cool last stand type of scene. I wasn't a huge fan of the fight scenes this season. A bit too much shaky cam combined with the fights often devolving into brawls made me lose interest. The plot points were pretty predictable, although I suppose the writers weren't trying to hide any huge twists. I did think they were better about not delaying the reveals forever unlike some previous seasons.